GR is part of a family of steroid receptor proteins that control cellsâ€™ responses to hormones such as estrogen, testosterone and aldosterone. Our genomes contain separate genes encoding each one. Scientists think that this family evolved by gene duplication, branch by branch, from a single ancestor present in primitive vertebrates. Evolution of the steroid receptor family. Courtesy of Jen Colucci. When GR turns genes on, two protein molecules grasp each other while binding to DNA. When it turns genes off, the two protein molecules bind on opposite sides of the DNA helix, adopting a slightly different shape to do so. The repressive mode is thought to be responsible for the inhibitory effects of cortisol and GR on the immune system. The other steroid receptor family members only bind DNA in the activating mode. With collaborators from University of Chicago (Joe Thornton — intriguing 2012 profile of him), Georgia State (Ivaylo Ivanov) and Scripps Research Institute (Douglas Kojetin), Ortlundâ€™s laboratory has been examining the structure and function of steroid receptors from organisms that are now extinct. The researchers â€œresurrectâ€ the ancient proteins through computer analysis and then synthesis. 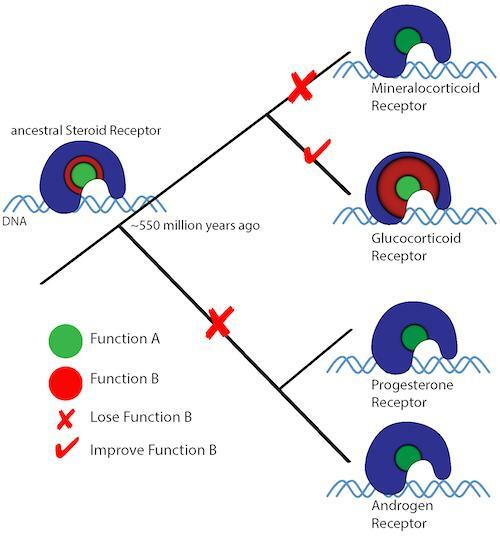 They were surprised to find that an ancestral steroid receptor â€“ giving rise to the modern day steroid receptors, including GR (see figure) — could bind DNA in both activating and repressing modes. â€œInstead, it looks like GRâ€™s repressive DNA binding activity goes way back, and that subsequent mutations shut that activity off in other family members besides GR,â€ Ortlund says. Additional investigation showed that the mutations that squelched steroid family membersâ€™ ability to bind DNA repressively didnâ€™t affect the part of the protein that directly contacts the DNA. Rather, they affected its flexibility and its ability to adopt different shapes. Human understanding of how GR shuts genes off is also relatively recent; how steroid hormones activate genes has been understood roughly since the 1980s, but the paper describing repressive DNA binding by GR was published in 2011.